WINNIPEG - 2012 has to be regarded as another exceptional year with sales only nudged out in 2007 and 2011 by the slightest of margins. Annual dollar volume resulted in moving the bar a little bit higher again and it is only the second time in WinnipegREALTORS® 109-year history where sales dollar volume has exceeded the $3 billion mark achieved in 2011. In only 5 years, the total MLS® dollar volume has increased 44%. This increase equates to nearly $1 billion. While December MLS® sales fell short of last year’s record level for this month, the over 600 sales are still 5% above the ten-year average. There are enough of them to bring the year-end total sales to just over 13,000, a milestone level only reached twice before in 2007 and last year. Despite MLS® monthly dollar volume being well off 2011 December’s all time best; the annual dollar volume eclipsed the $3 billion record level established last year. New listings entered on MLS® were up slightly in December and finished the year ahead as well. December MLS® unit sales decreased 12% (615 vs. 698) while dollar volume dropped 14% ($156.2 million vs. $182.0 million) in comparison to the same month last year. 2012 MLS® sales were down less than 1% (13,007 vs. 13,065) while dollar volume was up 5% ($3.20 billion vs. $3.06 billion) in comparison to 2011. The 18,704 listings entered on MLS® are up less than 2% over 2011 however are 12 % higher than the ten-year average. An encouraging development in 2012 was increased listing inventory to create more balanced market conditions. Having said that, many Winnipeg neighbourhoods are still dealing with an extremely tight supply of active listings. In many respects, they have but a handful of listings left at the end of 2012. And that was no different last year. Winnipeg has been referred to as one of the tightest real estate markets in the country and has been for a prolonged period of time. Helping in providing some relief this past year was the healthy addition of new single family and multi-family starts. They act as a safety valve for the resale market and in many instances create new existing inventory since buyers of new homes are putting their own homes on the market to sell in order to get the required equity from them to make a new purchase. Where there is more breathing room is in the rural municipalities as there is not the same degree of demand so consequently their profile is one of more balanced supply and a better inventory situation as a whole. Yet the rural area continues to grow as a portion of total MLS® sales in the greater Winnipeg market region. In 2012, rural MLS® residential-detached sales comprised one out of every four transactions. Speaking of property types, the one achieving the most success in 2012 was vacant land. It was up 25% in sales and now represents 5% of total MLS® market share. Single-family or residential-detached is still by far the most dominant at 73% and condominiums made up another 12% of MLS® sales. The most active residential-detached price ranges in 2012 were the $250,000 to $299,999 and the $200,000 to $249,999 price ranges as they had 22 and 19% respectively of total sales. Not far behind was the $150,000 to $199,999 price range at 16%. Worth noting is for the first time there were more sales in the highest price range bracket of $500,000 and above than the lowest from $0 to $99,999. It is also noteworthy to indicate the upper end market sales have never been so strong. There were over 400 in total and 24 of them sold for $1 million or higher. Two fetched $2 million or more. 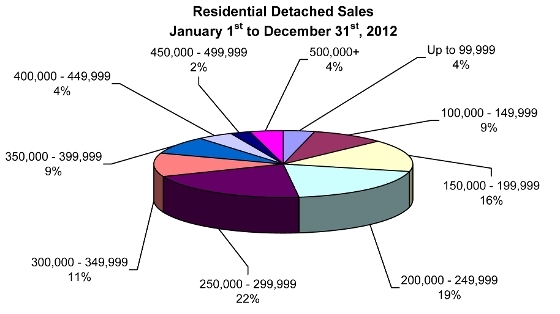 The average days on market for residential-detached sales in 2012 was 28 days, just two days off the pace set in 2011. The highest sale price was a new record at $2.2 million, while the lowest only $8,000. The provincial land transfer tax levied on the highest priced home is more than five times the cost of the lowest priced home. The most active condominium price range in 2012 was the $150,000 to $199,999 at 35%. A distant second was the next higher price range of $200,000 to $249,999 at 20%. In comparison to last year there were 18% less sales under $200,000. The average days on market for condominium sales in 2012 was 34 days, 5 days slower than 2011. The highest sale price was $925,000 while the lowest was $20,000. More details on the year that was in 2012 will be reviewed in more depth at WinnipegREALTORS® annual forecast event to be held on Wednesday, January 16th. Predictions will be made for MLS® sales activity in 2013.